We have all tasted dips that we found delectable! Such is the case with a smoked salmon dip I bought at Costco. I have tried a few in the past only to be disappointed in the flavor. Not so with this one….they were passing out samples that day and I was very impressed with the quality. La Terra Fina makes it and salmon is the second ingredient behind cream cheese. It has red onion, celery, capers and is spiced well with lemon, black pepper, garlic, and dill. With my husband working, weren’t doing anything for New Year’s Eve and I really had no “occasion” to buy it coming up soon. But I just couldn’t pass it up. How to make good use of it for something more than snacking on? (Not that my guys would complain about having this to snack on….. ) They listed a recipe using it for a spread for wraps. I wanted to take a bit further than that. What about a sauce? Smoked salmon is a very strong flavor so I had to tread lightly with this idea. How about a sauce used as a topping? I could thin the dip with low fat buttermilk to keep the tangy flavor and produce a sauce. I decided to use brown rice and farro together. (See note) Saute onions and peppers together slowly to bring out their sweetness and season them with lemon and dill. Top with a bit of the smoked salmon “sauce” and we should have a winner here. But how to make it special…. Crepes came to mind.. Making crepes is easy. I combine my ingredients in the food processor and then refrigerate the batter for at least an hour before using. 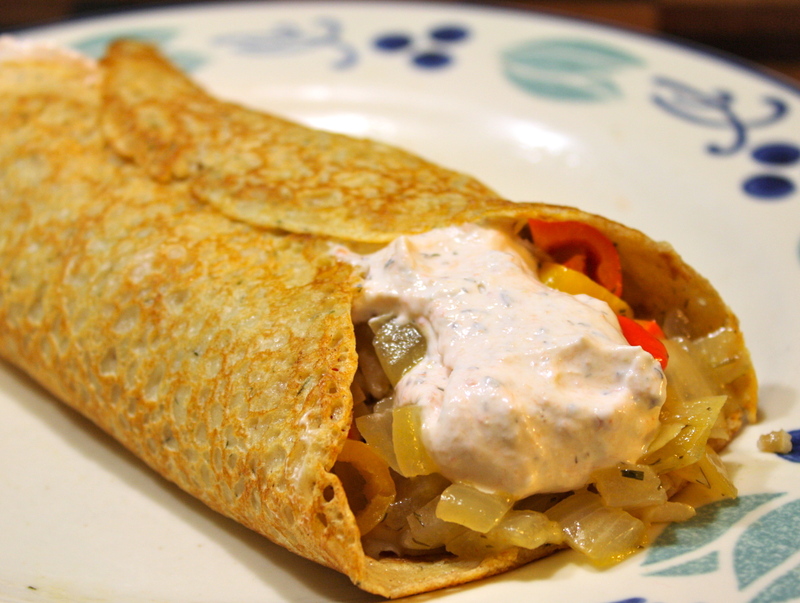 This gives you a tender crepe, yet it doesn’t fall apart during cooking. Fill with the grains and veggies, then top it with the sauce. Yes! Wrapped in a whole wheat crepe sounded good to me. Note: It has demonstrated that cooking grains with an abundance of water instead of in a “measure proportion” results in a faster cooking time with a more evenly cooked grain and better texture. It’s true. My brown rice/farro combination was done in about 20 minutes! 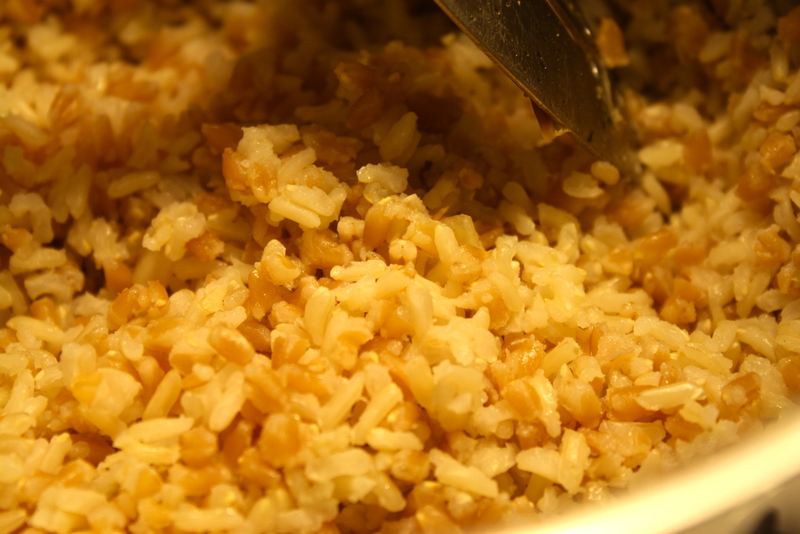 Begin checking for doneness after 15 minutes and drain excess water when the grain is tender to taste. Combine above ingredients in food processor until smooth. Refrigerate for at least one hour (up to 2 days) before using. 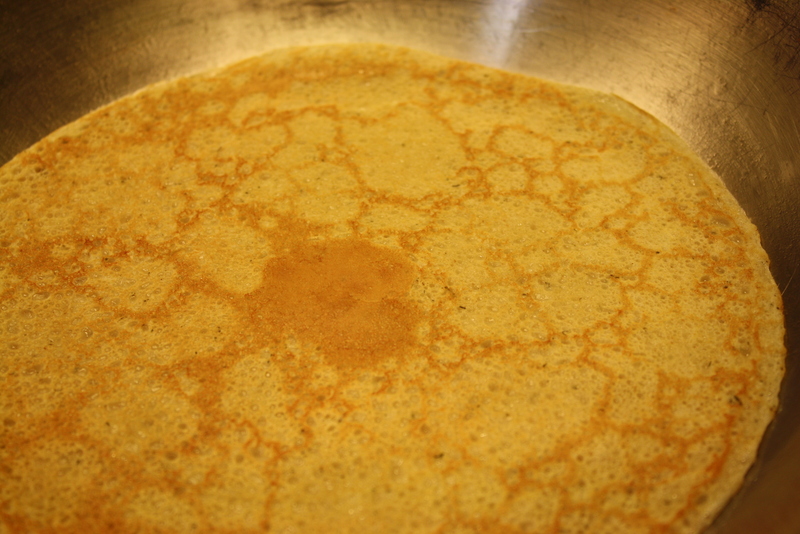 While waiting for the crepe batter to rest…..
Place grains in a 3 quart pan and fill with water. Cook over medium heat. Begin checking for doneness after 15 minutes. When grains are tender, drain water. Return to pan and drizzle with small amount of olive oil and fluff. Cover and set aside. While the grains are cooking and the batter rests….. 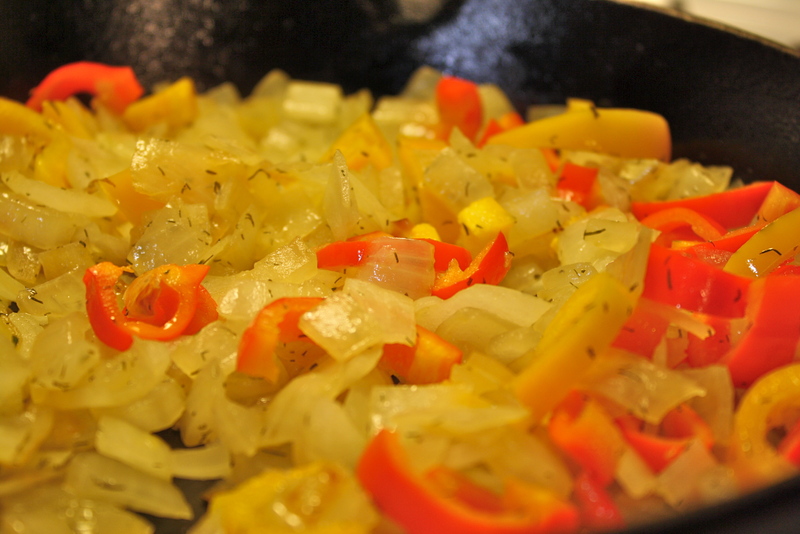 In a medium skillet, saute the onion and pepper over medium heat until golden and soft. Sprinkle with lemon juice and dill and cook until lemon juice is evaporated. Remove from heat and set aside. Lo fat buttermilk, as needed. Prepare 3 tbs melted butter. Have a silicone brush on hand. Heat a 9-10 inch skillet over medium heat. Brush lightly with melted butter every 2-3 crepes. Add 1/4 cup of batter to the pan. Tilt and swirl pan to evenly coat the bottom. Allow to brown for 1-2 minutes. Slide spatula under the edge and flip to brown the other side. Assemble with grains on first, veggies on grains, top with sauce. Wrap up the crepe and Serve. No “dainty” crepes here. My guys try to get as much in them as possible. Enjoy!